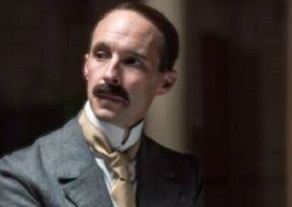 Thaddeus O'Sullivan's docudrama, starring Tom Vaughan Lawlor as Lane, airs on RTE One. 'Citizen Lane' is a feature documentary set in Dublin in the early years of the 20th century - a time of political ferment and the forging of a new Irish cultural identity. It tells the story of Hugh Lane's hard fought project to establish a public modern art gallery in Dublin. The film's structure cuts between scripted drama - starring Tom Vaughan-Lawlor as Lane, Michael Gambon, Barry McGovern and Derbhle Crotty and a series of 'character interviews' with Lane's friends and family. The interviews and dramatic re-enactments are also interspersed with engaging contributions from historians Roy Foster, Paul Rouse, and Morna O'Neill. Released theatrically by Eclipse in May of this year, the story is written by Mark O'Halloran and directed by Thaddeus O'Sullivan. Sheila Ahern, Jane Doolan and James Mitchell produced the project with Mammoth Films. The project also had Katie McCullough on cinematography and Mick Mahon editing.